IXIASOFT CCMS 5.1 offers the “finishing touches,” to version 5.0. The 5.0 was a big step, and introduced major features like content level security and easy authoring for SMEs. IXIASOFT CCMS 5.1 offers a more tailored version with new features like a lite map editor, revamped UI, and localization from a snapshot. Along with the 5.1, we’re offering a brand-new add-on: oXygen WebHelp for IXIASOFT CCMS. The add-on provides automatic index generation table of contents navigation, and mobile compatibility. Not only do we sell the add-ons; we’ve integrated it into our own platform. Check out oXygen WebHelp for IXIASOFT CCMS in action here. [DEV-6980] In IXIASOFT CCMS Web, moving a topic to Authoring:complete (or equivalent status) creates a blank Revision History entry that is visible in IXIASOFT CCMS Desktop. [DEV-6756] The IXIASOFT CCMS Web installation program does not support the following characters in the password as clear text: & ‘ “. These characters can be used if the password is encrypted. [DEV-6734] The Collaborative Review in IXIASOFT CCMS Web does not display text contained within a <shortdesc> element. [DEV-6717] When a topic is edited in IXIASOFT CCMS Web, the XML is always reformatted to pretty-printed. [DEV-6018] When map templates include auto-generated topics in IXIASOFT CCMS Web, topics are created but they are not automatically assigned. This issue occurs when the method name=”CreateTopic” in the accessrights.xml file is configured for multiple roles and the first role is not active. [DEV-7179] When generating output on a snapshot, the Ditaval dialog box is blank and does not list existing ditavals. [DEV-6848] In standard deployments, the Resolve Keys button in DITA Map view is not functional. The button is functional for DRM deployments. [DEV-6106] When importing SVG images that contain JPEG @xlink:href dependencies, the .jpeg files are renamed to .jpg. This causes an image error when viewing the topic in the oXygen editor. The workaround is to edit the SVG image to use a .jpg extension. [DEV-5878] The Prepare Localization Kit fails if it is configured to generate an output (enabled by default) using DITA OT 2.5.4. Contact IXIASOFT Support for assistance with a workaround. [DEV-7801] If the system/conf/languages.xml configuration file did not have the “English” language defined, a java.lang.NullPointerException error appeared when trying to create a ditaval. This issue has been fixed. [DEV-4908] The Build Manifest feature required maps to be at the Localization:done state. The /system/templates/bmanifests/build-manifest.bmanifest configuration file can now specify which states can be included. For example, <locstatusend>Localization:review;Localization:done</locstatusend>. When generating output on a snapshot, the Ditaval dialog box is blank and does not list existing ditavals. [DEV-7172] Topics were not resolved in the oXygen editor when right-clicking a map and selecting Open With > XML Editor with resolved topics. This issue has been fixed. If the “com.ixiasoft.cms.triggers.CreateTicketTrigger” trigger was enabled, a java.lang.NullPointerException error was displayed when performing a change status on a document. This issue has been fixed. error to appear when creating topics. This issue has been fixed. The trigger to check for out-of-scope map links did not run when a map was a child dependency of an object other than a map. For example, a build manifest or snapshot. This issue has been fixed. Important: Install and upgrade documentation is available to current customers on the Downloads website. [DEV-7025] TEXTML for Windows had a handle leak when using Kerberos authentication which sometimes caused the process to stop. This issue has been fixed. If the “com.ixiasoft.cms.triggers.CreateTicketTrigger” trigger is enabled, a java.lang.NullPointerException error is displayed when performing a change status on a document. When trying to insert an image into a topic in IXIASOFT CCMS Web, the image picker window sometimes remained open and the image was not inserted. This issue has been fixed. [DEV-6492] IXIASOFT CCMS Web sometimes became unresponsive when selecting Create Map. This issue has been fixed. [DEV-6306] Editing a topic in IXIASOFT CCMS Web reformatted the XML to one line. This issue has been fixed. [DEV-6299] If a user’s last name included an apostrophe, the IXIASOFT CCMS Web Collaborative Review did not allow them to add annotations. This issue has been fixed. [DEV-6161] Encrypted passwords were not supported for the IXIASOFT CCMS Web installation script. This issue has been fixed. [DEV-6114] The IXIASOFT CCMS Web log file (ixiasoft-ccms.log) was not created into the right location at startup on Linux. The log4j2.xml file contains the correct information for the location of the log. This issue has been fixed. Updating components in the IXIASOFT CCMS Desktop dropins folder did not update correctly. This issue has been fixed. When a user created a new ditaval folder in the Ditaval view, the system/config/ditavalfolders.xml configuration file remained locked. This prevented other users from creating or deleting ditaval folders. This issue has been fixed. DITA Map view experienced performance issues when opening a map that contained a lot of keydefs. This issue has been fixed. [DEV-6286] The Preview view did not correctly filter contents with conditional attributes. This issue has been fixed. [DEV-6199] IXIASOFT CCMS Desktop had performance issues when a user had more than 200 documents locked. This issue has been fixed. [DEV-6140] Starting IXIASOFT CCMS Desktop in debug mode prevented the DITA perspective from loading. This issue has been fixed. [DEV-6075] When the accessrights.xml file was configured to use specialization=”true”, standard document types including map and topic were not able to be locked. This issue has been fixed. [DEV-5866] Images that were imported using the “Import Images with Multiple Formats” feature were not properly updated when they were later imported as part of an “Import Maps” or “Import Topics” operation. This affected imports using the “Update existing documents” checkbox selection. This issue has been fixed. [DEV-5792] When performing a Retranslate from source on content that was localized from the published cycle, an error message “Unable to retranslate” appeared. This issue has been fixed. [DEV-5426] When creating a topic and appending it to the bottom of the current map open in DITA Map view, the map refreshed and placed the cursor at the top of the map. This issue has been fixed. [DEV-5347] The Assignments dialog box was slow to display when a Content Store had more than 1,000 user accounts configured. This issue has been fixed. [DEV-5299] Some image formats became corrupted when multiple users performed changes on the same image. For example, User1 created an image. User2 then edited the image to add or remove some image formats and changed the image to Authoring:done. If User1 changed the image back to Authoring:work, they would no longer see the edited image format. This issue has been fixed. The Preview view displayed a “No active preview available” error message if a topic contained a conref or keyref. This issue has been fixed. [DEV-4422] Importing topics with keyrefs failed if the map with the defined keys was not imported first. The import feature now includes an option to import topics without having their keys pre-defined. [DEV-3909] For the concurrent localization method, images created with the “Needs Translation” checkbox cleared, were set to Localization:tb translated and included in localization kits. This issue has been fixed and the images are now set to Localization:done. [DEV-3701] Importing topics that contained self-references sometimes incorrectly changed the links to reference other topics. This issue has been fixed. [DEV-2348] The linguistic review process was only available for the sequential and node-based localization methods. This issue has been fixed and it is now also available for the concurrent localization method. [DEV-6350] IXIASOFT CCMS Desktop allowed users to incorrectly clone a sub-library and add it the same parent library which created an invalid DRM structure. This issue has been fixed. [DEV-2363] When generating output on multiple maps in one operation, a copy of the output was kept in the user’s workspace. This issue has been fixed and the folder is removed to prevent disk space accumulation. [DEV-6479] Generating output from a build manifest with a ditaval specified did not correctly filter content. This issue has been fixed. [DEV-4090] When generating output on multiple maps with an output type that does not return content, the output generator returned broken .zip files. This issue has been fixed. [DEV-6706] TEXTML did not close IXIASOFT CCMS Web sessions when the specified timeout value had been surpassed. This issue has been fixed. TEXTML for Windows had a handle leak when using Kerberos authentication which sometimes caused the process to stop. This issue has been fixed. Note: All documentation for upgrading and installing components of IXIASOFT CCMS 5.x are available from the IXIASOFT Downloads site. All current customers can contact Support for the URL. Upgrading a DITA CMS Web from 4.5 to 4.6 Upgrading IXIASOFT CCMS from 4.x to 5.1. The advanced user guide for IXIASOFT CCMS version 5.1 is packed with information to help users author, manage, publish, and track their documentation. 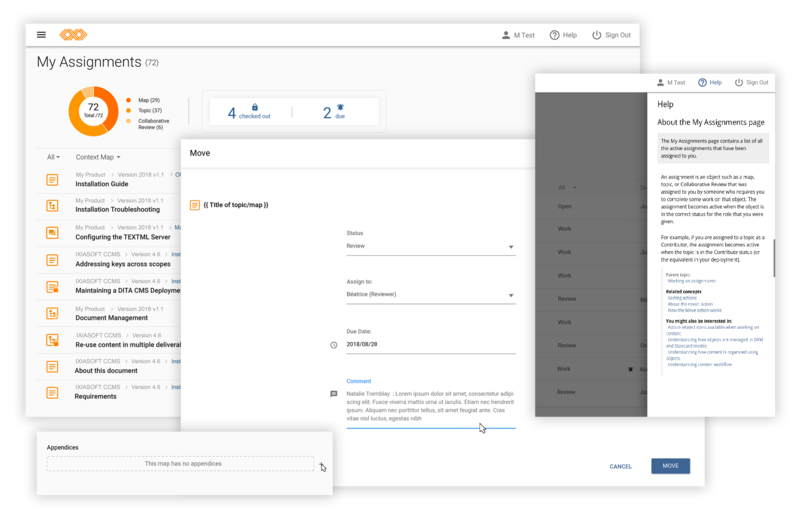 Version 5.1 offers tremendous control and flexibility, allowing users to work modularly, re-use content in multiple deliverables, manage the localization process, and much more. Read on to get started. This user guide covers the basics from A to Z. Not only will it teach you how to use IXIASOFT CCMS Web, it will help you understand the intricacies of how it works. Learn how to create and edit a map or topic, work on an assignment, or perform a collaborative review. This step-by-step guide makes it easy to get acquainted with version 5.1.